Space Saving - 2 Buildings in 1! Rowlinson Potting Store: A brilliant building which doubles up as both a potting/greenhouse area and a storage/shed area. The potting and greenhouse section has 3 opening and 7 fixed styrene windows allowing plenty of light and ventilation to optimise the environment for your plants. There is also plenty of space to store your garden items towards the other end of the potting store. Also includes a padlock which can be secured with a padlock (not included) and comes complete with the potting benches/staging. A brilliant multi purpose potting store, perfect for the keen gardener or DIY-er. Showing 2 of our total 3 reviews, with an average rating of 5 stars. Read all 3 reviews for Rowlinson Potting Store with Felt Roof and Glazed Windows. 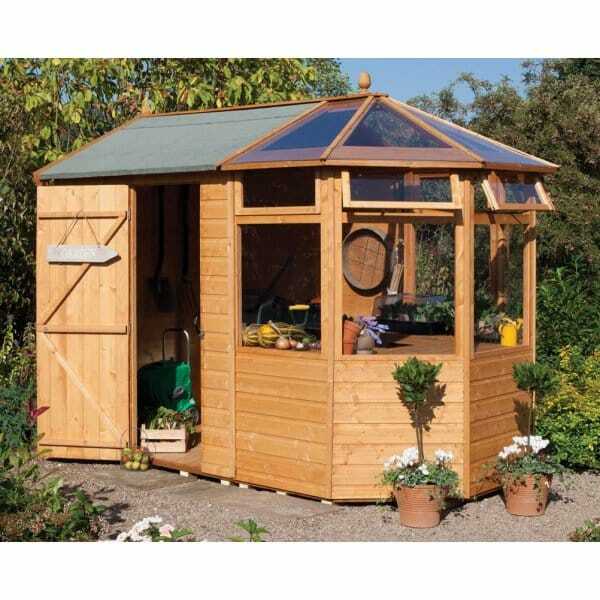 Review - This is a lovely cross between shed/greenhouse if space is limited. Plenty of table space for seeds and plants. Good storage space under table. No problems with building it. I painted each panel inside and out before we put it together. I have room for all my gardening stuff plus room for a nice sun chair to sit in. I just love it. Very happy. This is a lovely cross between shed/greenhouse if space is limited. Plenty of table space for seeds and plants. Good storage space under table. No problems with building it. I painted each panel inside and out before we put it together. I have room for all my gardening stuff plus room for a nice sun chair to sit in. I just love it. Very happy. Review Title - Best purchase I have made for years!